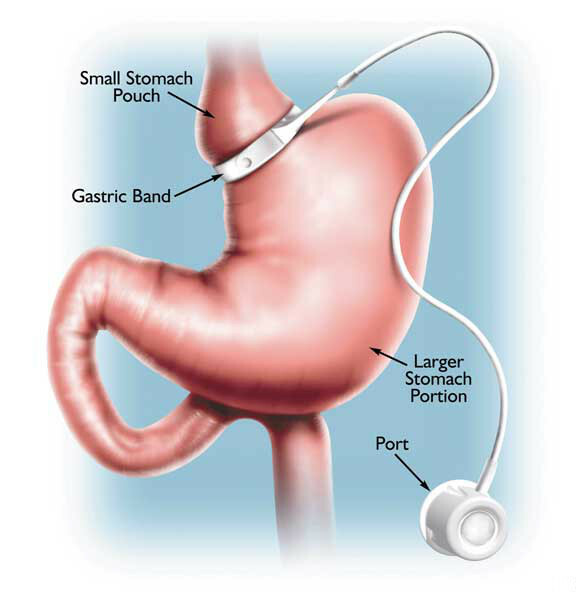 Adjustable gastric banding is a purely restrictive weight loss surgical procedure. The procedure is usually performed laparoscopically (key-hole) via small incisions in the abdomen. An adjustable silicone band is placed surgically around the upper portion of the stomach creating a narrow opening into the larger portion of the stomach. Once in place the band acts to slow the passage of food through it and into the stomach. The band also places pressure on the nerves at the top of the stomach which signals the brain that you are now satisfied after eating a much smaller meal. The combination of reduced food intake and feelings of satiety result in weight loss. A major advantage of the band is that it can be adjusted. The sense of satiety is induced by the band placing pressure around the top of the stomach, so by adding or removing saline we can adjust the level of satiety and enable you to achieve your weight loss goals. 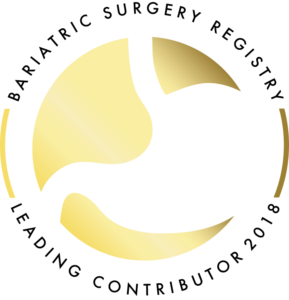 Gastric banding patients require regular follow up care for the life of their band (which is designed to last a lifetime). The gastric band is a tool and if utilised well in conjunction with appropriate lifestyle changes, can provide patients with effective and sustained long-term weight loss. New studies have shown that after 10 years, patients on average had maintained a weight loss of 54.2% of their excess weight. These may require further surgery to correct, replace or remove the band. Some foods are not well tolerated, and most patients avoid bread and some red meats after the procedure. As with any weight loss procedure lifestyle changes need to be made in order to maintain long term weight loss. It is important to understand that weight loss surgery requires a life long partnership between patient and surgeon, requiring long-term follow up care to ensure the best possible results are achieved.